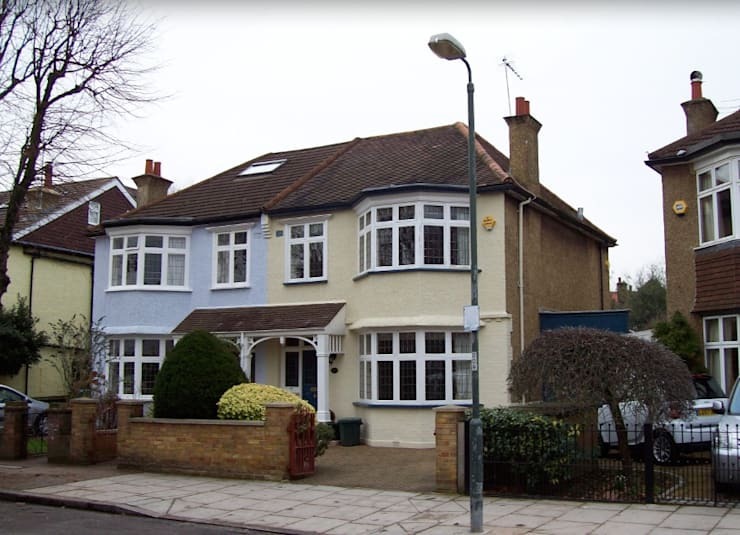 Thanks to the architects at Paul Wiggins Architects, this three-bedroom home was renovated into a spacious five-bedroom home, with an additional two bathrooms to bring the total count to three! 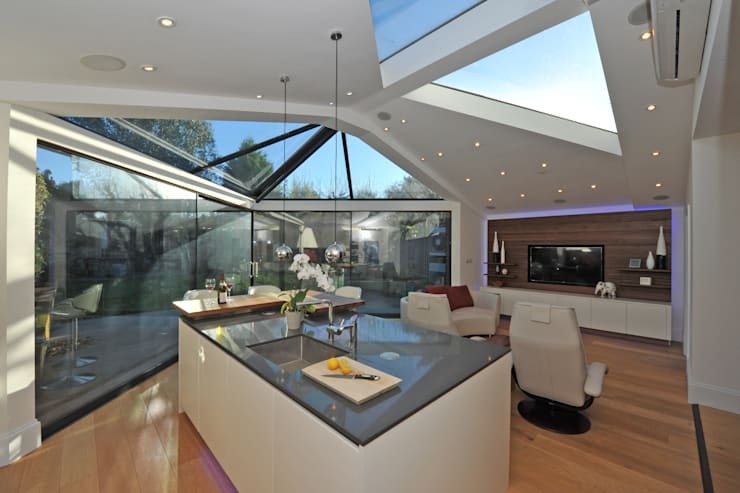 Expanding both outwards and downwards, the home has also increased its capacity through an expansion in the basement, which now houses a rather enviable home gym and luxurious wine cellar. Looking at the front of the home, you'd never guess that any renovation is happening (or needs to happen, for that matter). A classic 1920s facade has been well-maintained over time, bringing this colourful family home gracefully into the 21st century while preserving the structural design elements of the past. The back of the home is where all the action happens in this renovation project – the original garage space is maintained throughout, but it is converted from a utilitarian storage space into a living space, home gym, wine cellar, and bike storage space, all in one. 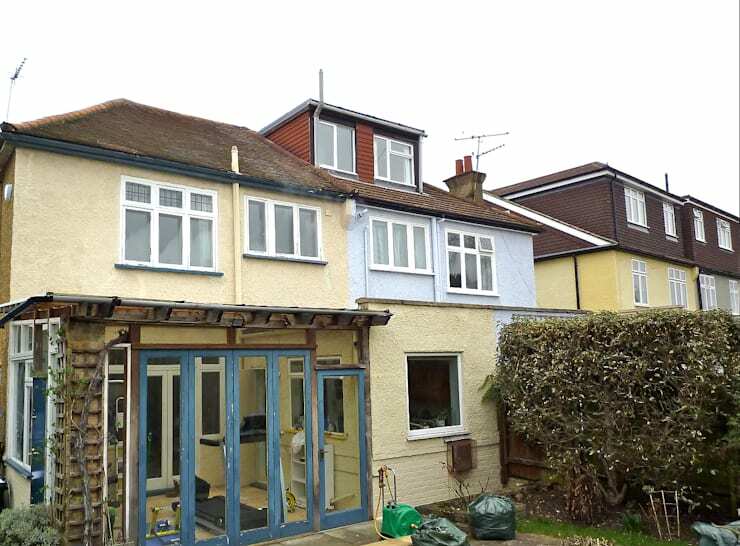 Some renovation projects quietly conform to the existing character and materials of the original building – from looking at this initial photo of the new addition, you can see that this renovation job doesn't intend to blend in quietly! With a cantilevered glass roof, polished metal siding, and glossy reflective windows replacing solid walls, this expanded living space is like a time capsule housing futuristic elements, while the rest of the home maintains a more classic 1920s suburban vibe. Making a bold statement with its pointy form, this lower floor addition appears to jump out energetically from the main building mass, making an a loud and proud entrance to this home's previously quiet backyard. Inside, you can see the spot where the backyard has been hollowed out in order to make room for an expanded basement – a glass balustrade marks the connection between the new basement stairs and the luxurious living room and kitchen that you can see from this backyard viewpoint. 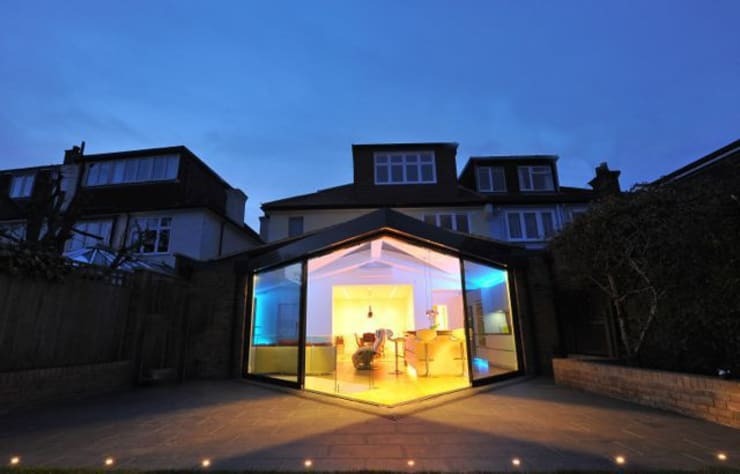 At night, the bold statement coming from this new addition becomes even more apparent! Positively glowing with bright LED lighting, this expansion brings a light, modern space into the quiet garden, illuminating a smooth brick patio for friendly gatherings that stretch on into the wee hours of the morning. This renovation job has gone far beyond improving a sagging backyard porch – instead, the small porch has been replaced with a major addition to the home – here you can see a sunlight living room and kitchen extending out into the backyard. Skylights preserve the original sunroom character of the screen porch, but now the structure has become a permanent and high quality addition that will provide more space for a large family. Everywhere you turn, you can see that no expense has been spared in this reno job! Aside from the custom-built triangular sections that give this structure a futuristic feel, the white leather furniture within the space offers the utmost in quality and high-end design. 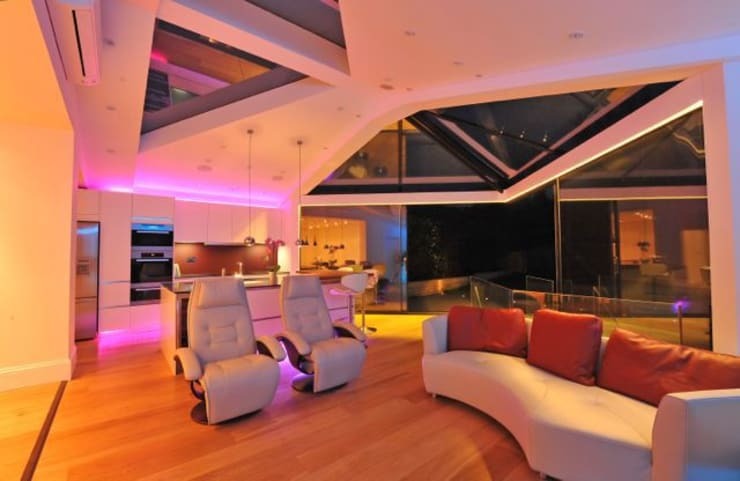 Decked out with luxurious, modern furnishings – and a little bit of energetic purple LED lighting – this space has become an excellent spot for entertaining in the evening! 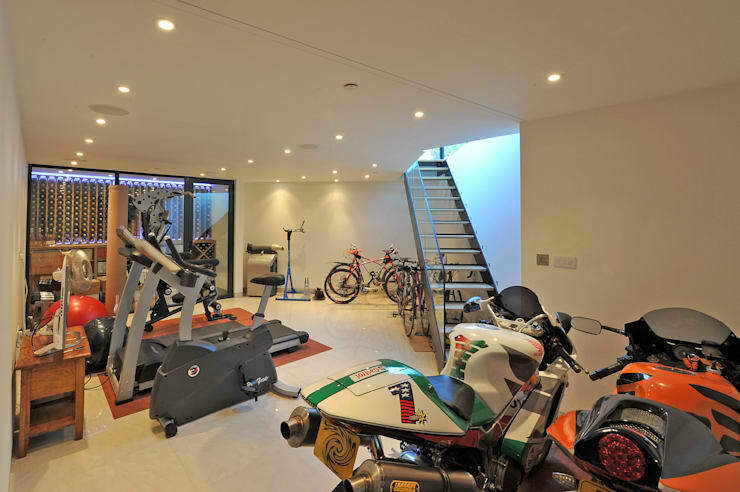 Descending from the new living room, a staircase leads down into a finished basement, complete with plenty of room for bike storage, as well as a home gym. Through the glass wall at the end of the room, you can also see a wine cellar enjoying a brand new space! 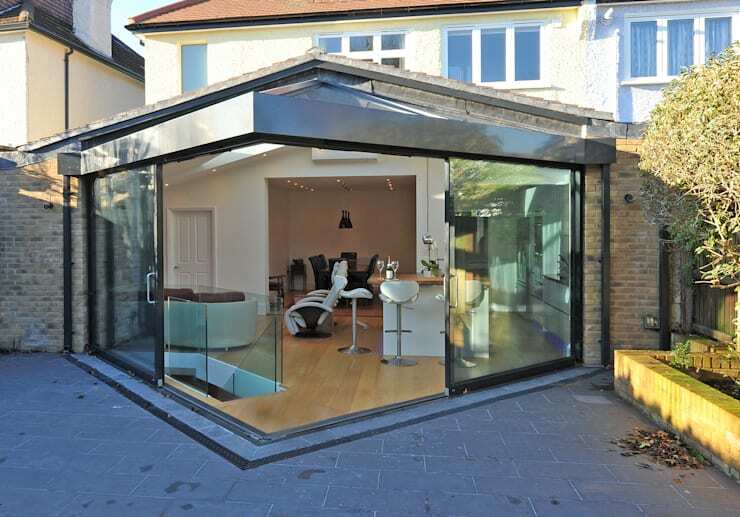 What do you think of this home renovation project? Comment below!